Grilled Asparagus is an excellent side dish that compliments just about any meat you can smoke or grill. The key to grilling great asparagus is to find thick and fresh asparagus. Do not use canned or thin asparagus as it will not grill very well as the pieces shrink faster than they cook so you end up with wrinkly grilled asparagus which doesn't taste very good. After a little practice, you will get the hang of it. I always taste a piece of the asparagus to check if it is done. It should have a nice crunch, but taste done. 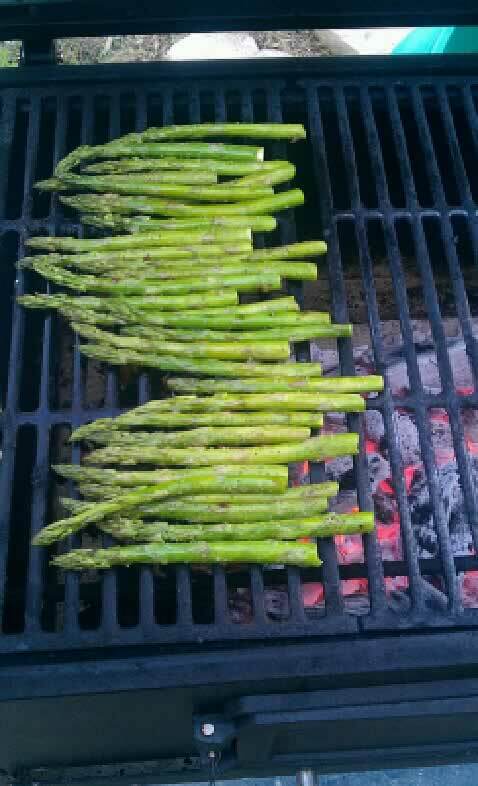 Be sure to drizzle some Balslamic Vinegar over the top of the asparagus after you are done grilling. This grilled asparagus recipe will impress your friends! Large, fresh asparagus - not canned. 1. Lay the asparagus on a cookie sheet. 5. Grill over a medium hot fire for 4-5 minutes or so. I like my asparagus done, but I like a good crunch too. If you grill it too long, it will shrivle up and become soft. This part takes some practice. 6. Remove the asparagus and drizzle with a good balslamic vinegar. Serve right away.